This month, we’ll be rolling out Block Download for Anyone and Organization sharing links as well as updating the MyAnalytics feature on OneDrive mobile. We’re also announcing that Camera Upload for OneDrive on Android is coming out of beta for all users! As always, feel free to leave your feedback, comments or questions below. We are rolling out the Block Download feature for sharing links. With this feature, users will now be able to share a link to Office documents that can block recipients from the file, making copies of the file, copying text into other applications or printing. Even with these settings enabled, the user is still able to view the document in Office Online. Users can create links that block download by using the common sharing experience that exists across Office 365. By going into Link Settings they’ll be able to toggle the “block download” option for view-only links. This feature will begin rolling out in late November. We are updating the MyAnalytics feature in the OneDrive for iOS & Android apps. This feature now adds new entry points to the view count and context menus for individual files to make it easier to see everything that’s happening around your files. We are improving the service itself so that view counts are more accurate and will match the analytics that are available on OneDrive web. We are also removing the “File trending” signal in this release. You should start seeing these changes in your app in late November. Camera Upload on Android is now available! The Camera Upload feature for OneDrive on Android is now available for all customers! Once enabled, this feature will allow users to automatically upload all photos in the device Camera Roll to a selected OneDrive for Business account*. To enable this feature, go to the “Me” view from within your OneDrive for Business account and tap “Photos”. You will see a prompt like the one below, tap “Turn On” and read the ensuing prompts carefully. This will begin rolling out to customers later this month. *Please note that OneDrive only supports one account (business or consumer) to be used at a time for the Camera Upload feature. Block Download for Anyone and Organization sharing links. Where’s the news around “Organization links”? Organization links are just links that only work for people in your organization (sometimes called "Internal" links as well). Hope that helps! Is this possible to prevent "Block Download" globally, so by default "Block Download" is disable and user can not enable this? I believe MS provided this feature using group policy? Will block download be implemented with the option specific people rather then the everyone choice? To be able to block the download for organizational links is interesting yes. @Stephen RiceHow far off is camera upload to OneDrive for Business on IOS? I am on Windows 10 Insider and Office insider and haven't seen the block download button as of yet. Did this rollout ? How can I get it ? Will the Block Download option also made available for non-office programs? we are really interested in blocking the download of movies. @Avian 1, there is no policy available to require Block Download on all sharing links. There are some conditional access policies that are similar though, which allow you to block download on un-managed devices for example. @Maurits Knoppert, this is something we are looking at as well but Block Download for specific people will be coming a bit later. Stay tuned! @Jacques Alexandre Bergeron, as announced at Ignite, we aqre working on expiration on a per site basis now (i.e. a user's access to everything on the site will expire at the same time). We are looking at per-link expiration as well. Definitely go submit/vote for this at onedrive.uservoice.com though! @Peter Whitehouse, that should be there now. Are you not seeing it on your device? @Stephen Kerkmann, the Block Download feature is still rolling out and so may not be available in your organization yet. Stay tuned! Thanks Stephen. It will be great to add those in the roadmap so we have better visibility on those element. Nothing let us know in the user voice or elsewhere you are working on those features. 1. Are there any notification on "Block download" expiration date to site admin/owner? 2. How to block download feature for few user if access given to the group in which those few users are member? What about reverse option "Direct download link"? This would be helpful situations where any kind of preview is not needed, or where preview craps out (for example on Excel files larger than 30MB) and blocks any access to the file? a) User clicks on link and cannot "save as downloaded file"
2) Same user - navigates to the doc library where the file is saved. Sees the file. Shouldn't 1a block the ability to do 2a? If not, then what's the purpose of this feature? Hi @Senthilrajan Kaliyaperumal, on your first point, can you clarify a little further? On your second point, if a user is a member of a group that was shared to with block download, then the entire group will have the block download permission applied. You can share different links to different users if you want some to have block download and others to not. @Tomasz Czerniejewski, this is something we've thought about but don't have anything specific to share. Definitely submit this to onedrive.uservoice.com though! @Kevin Crossman, if the sharing link is the only method by which the user has access to the file, it should prevent them from downloading regardless of whether the user is in the Office web apps or in the library view. Hope that helps! @Stephen Rice I see! Yes, I confirm that's the case. Thank you. I didn't see an option to block download when sharing to specific people. I'm guessing this option is giving direct access to the content (versus a sharing link), and by doing so that person now can get to the content directly, and therefore no good way of blocking the download. In contrast, when giving out sharing links, you're giving access only to the document via office online (Word Online, PowerPoint Online, etc.) where you can easily block user from downloading. Is that correct assumption? Almost! We are looking at adding support for specific people links as well. You are correct though that this works by only letting you access the doc via Office Online. Thanks! I see that photo upload is now available for OneDrive for Business, which is great but I have a question. How do I switch from uploading photos to my personal OneDrive over to OneDrive for Business? I have two accounts registered - personal and business - but I don't see a way to switch the photo uploads from one to the other. The Photos option is there under my business account but I don't see a way of turning off uploads to my personal account so I can enable my business account. It's likely obvious but I'm missing it somewhere. Any help would be appreciated. Camera upload support is now available in our Android app in version 5.22, which is still rolling out. Please give this a try on this version and let us know if you have any issues. Thanks! I'm running the 5.21.1 release so that may explain why I can't turn this feature on. 5.22 is not showing as an available update here in Canada, at least not on the Rogers network on my Huawei P20 Pro so I'll wait for a bit until I can get the 5.22 release. I'll try again after that and will post back with my results. We are still in the process of rolling out 5.22. It's not country by country but it is a general staged rollout that does take time to proceed. We want to make sure things are right and work as intended before we roll it out completely! Until we complete our rollout, you can check out the feature earlier by enrolling in the beta as a user above mentioned. Still not seeing the block download option. Running 18.235.1125.0006 of OneDrive ?? What version do I need to test drive the block download ? Block Download should be fully available on OneDrive & SharePoint Web and in the Office web apps. The rollout for the sync client and Office clients is still in progress. Thanks! @Stephen RiceHow does this new functionality integrate/conflict with files labeled by Azure Information Protection? I received the 5.22 version of OneDrive over the weekend and I can now choose between my personal and business OneDrive accounts for the camera upload. This feature is separate from AIP which focuses on document content. This is just a restriction that is applied to the sharing link itself. @Fred_Brown, glad to hear it worked! This is great news. Will we be able at some point to allow editing online of a file while a download is blocked. I want to prevent a team member from downloading a copy of a Word document, making changes while others are editing the master file in the cloud, and then have to go back and integrate changes. You may be able to accomplish this with with something like DLP or conditional access in AAD. We don't have any current plans to offer this as an option on a sharing link however. Thanks! I can see "Block download" option now but only if I select to share with people inside the organisation. It also only becomes available if the option "Allow editing" is unticked. Why would it only be restricted to people within the organisation? Block Download is currently only available for links that work for Anyone and links that work for People in Your Organization. We are planning to bring it to Specific People links in the future as well. Thanks! I'm trying this in our tenant and it works well in OneDrive when the file is in the root of the OneDrive for Business Library (but not in Shared with Everyone). In a SharePoint site (where a user otherwise has Read access) when I share using Block Download the user is still able to download the file. When we evaluate a user's access on an item, we look at all the permissions that the user has and then give them the maximum permission they have. So on OneDrive, the Shared with Everyone folder gives everyone a higher permission which is superseding the block download permission on the link. And on SharePoint, if the user has Read access, then that will also supersede the block download permission. Hope that helps! Set expiration is only available on links that work for anyone. If you're still not seeing it, let me know! Thanks! Is this share dialog being invoked from File Explorer? If so, I don't believe Block Download is available on that endpoint just yet. If you go to the OneDrive or SharePoint web though, it should show up. Thanks! Indeed it was... hopefully it'll make it into Windows 10 shortly. We don't see this option of Block Download in our Education Tenant. When will this feature be available for us ? Thanks! This feature of block download is currently not available in our Education Tenant. When can we expect this feature to show up ? Thanks! 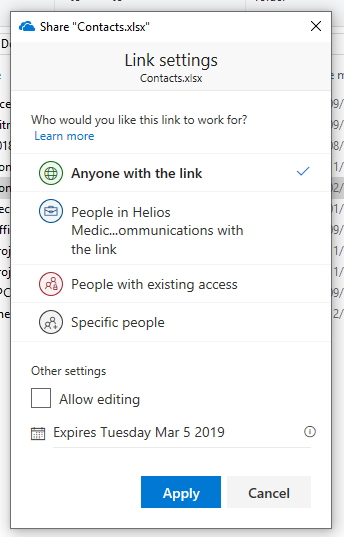 This feature should be fulled rolled out now for OneDrive and SharePoint web. We have not yet finished rollout for File Explorer or Office apps. Does that match what you are seeing? Thanks! Did I miss something in the tread or is "expiration date" forever only for links shared with everyone? Expiration on links is only available on links that work for anyone. Expirations on other links is something we are looking at but don't have anything to share right now. Thanks! It would be cool though, so I hope it will come one day.